Traditions and customs of Raksha Bandhan are very old and they are followed since ancient times. The day of Raksha Bandhan is very auspicious for Hindus as the day is a full moon day of the month of sravana (August) according to Hindu calendar. The day celebrates the beautiful relationship of brother and sister and the traditions and customs of Raksha Bandhan reflect the bond between brother and sister. The traditions and customs of Raksha Bandhan differ from state to state but still it is celebrated in the same spirit every where. Here are the traditions and customs of Raksha Bandhan performed by the people on that day. 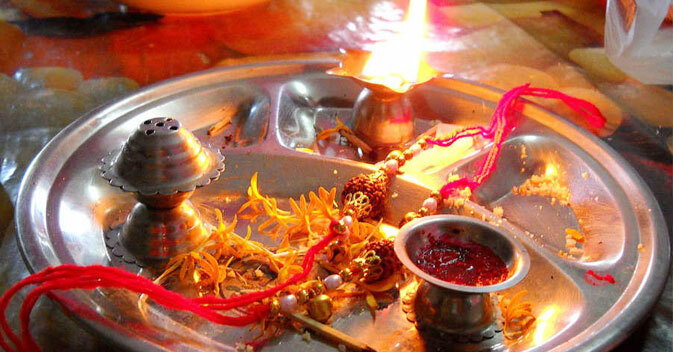 On the auspicious day of Raksha Bandhan people wake up early in the morning and after taking bath offer prayer. Sisters pray for their brother's well being. Many people also keep a fast on that day. Rakhi puja thali is prepared for the most important ceremony of the day. Rakhi puja thali includes kumkum powder, rice grains, Rakhi (sacred thread) and a small diya. These things are used while tying Rakhi. Tying Rakhi is an important tradition of Raksha Bandhan. The ritual begins with the sister putting a tilak on her brother's forehead. Then she ties Rakhi on his wrist. Tying Rakhi is followed by exchanging of gifts. Rakhi is a thread of love and it signifies the deep bonding between brothers and sisters. Literally, Raksha Bandhan means "bond of protection" and this bond is made through tying Rakhi. The customs and traditions of Raksha Bandhan make us realize the importance of this day for Hindus. The traditions and customs of Raksha Bandhan show that the festival of Rakhi is a festival of love and affection. A deep meaning of love is attached to the festival of Raksha Bandhan and no words can explain this meaning. So, celebrate Raksha Bandhan in a joyous spirit and enjoy the day. Browse through the pages of sendrakhi.com for more information on Raksha Bandhan.